Beliggende på en lille bakke i et boligområde og roligt område i El Campello, 100 meter fra havet og en sandstrand, er villaen med sin murede have fredelig. Ideelle forhold gør det en ekstraordinær wellness hele året. Her middelhavsklima fordele med temperaturer steady hele året, med solskin. Den gennemsnitlige temperatur er 12 ° C om vinteren og 28 ° C om sommeren. Hvis du ikke vil bruge din bil, sporvogn inden for 500 meter fra villaen tager dig langs kysten, Benidorm på den ene side og den anden Alicante (herunder direkte til den overdækkede marked Alicante ). I haven er der palmer, kaktus, oliven og bagsiden af ​​huset er, væk fra vinden, rum, bordtennis og basketball net! We all had a great time villa was really good. Estuvimos un grupo de amigos y ha estado todo perfecto. Aire acondicionado en salón y todas las habitaciones. La piscina muy agradable y con una playa a 100m con mucho encanto. Quizá un poco alejado de Alicante capital pero hay una parada de tren a unos 10min. Gracias Roberto, me alegro que pasas un buen tiempo en nuestra casa y piscina. Seguro que el aire acondicionado en toda la casa es muy importante especialmente con el calor de este verano. We stayed in Corine and Gerard's home from October to December. 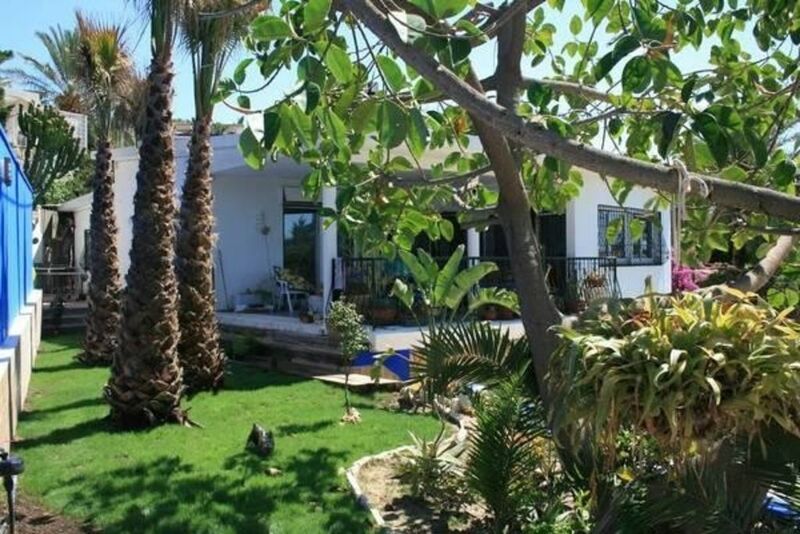 It is in a fantastic, quiet, location with views to the Mediterranean and only a short walk to the beach. The house is perfect for relaxing with a great pool and bbq area. It is fully equipped and has everything required for an enjoyable stay. It is also a great spot from which to explore the Costa Blanca and hinterland. We have no hesitation in recommending their home for anyone looking for a relaxed stay in comfortable surroundings. We were warmly welcomed and all had a very enjoyable time. The villa was extremely well equipped and furnished. The pool was a lovely luxury with plenty of loungers. Everyone enjoyed the crocodile. We would really recommend this villa for a relaxing holiday. Thank you very much for you nice review. It is always great to hear that our guests spent lovely time in our villa.We always try to give the best. It was a pleasure welcoming your family. You can come back any time. We loved the pool and spent the majority of our time on the terrace and in and around the pool. As it was August the weather was beautiful. Towels are not included and there is an extra charge to rent the towels from the owners. There is a submerged spiral staircase in the living area and attention needs to be given to small curious children who could be at risk of falling. The air conditioning works very well. The best bedroom is the master bedroom. All kitchen appliances work very well. The beach is 2 minutes walk away, it is a small local beach. There is a nice row of around 5+ restaurants about 10 minutes walk away (some uphill) in the village. They face onto a playground which the children loved and we spent some lovely lively evenings there. We would recommend the SIngapore Garden restaurant. There is a small shop opposite the tram stop which is 10 minutes walk away. The town of El Campello is two stops away and there is a supermarket right beside the station and a taxi rank to bring shopping home cost €8. There is a promenade with a large selection of restaurants and tourist shopping. We also went into the town of Villajoyasa by taxi (€60 return) and had a very nice dinner in El Guiterra restaurant; excellent food and very friendly service. Muchas gracias por la apreciación...hasta la próxima! For information, hvis du kommer med bil og ankommer fra Alicante ved N332 til lejer den Coveta Fuma, drej til højre efter den første Petronor servicestation. Highway: adgang fem minutter Lufthavn 20 minutter. Lavprisforbindelser med Ryan Air. Sporvogn langs havet mellem Benidorm og Alicante standser 500 m.
Billeje i lufthavnen for at se seks gode priser. Også købmand og biludlejning 500 m fra villaen.